Spirulina is a blue-green algae found in alkaline fresh water-bodies. Natives of Africa have been using spirulina as a part of their diet for thousands of years. But it's only in the recent years, spirulina is being promoted as a health supplement in India. 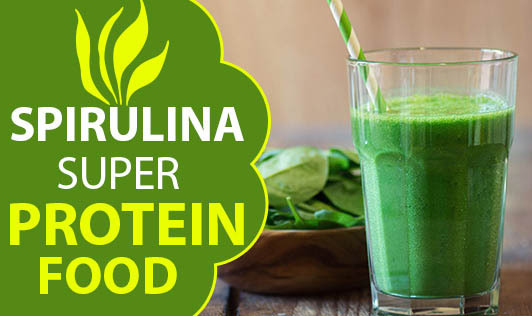 Spirulina is a natural source of protein. It provides about 70% protein (much higher than meat and fish) with all the essential amino acids, the highest from a single, natural source known to man. Along with protein, it's also rich in many of the vitamins, minerals and antioxidants. It's particulalry useful for vegans because it contains vitamin B12. Because of its rich nutrients, it's being promoted as 'food of the future'. It has found use as a food supplement, in health promotion and in cosmetics. Not everyone needs to take spirulina. However it is useful for those who are in need of extra nourishment or those who are unable to eat their meals well. Do consult your dietitian to find out whether you need a spirulina supplement or not.